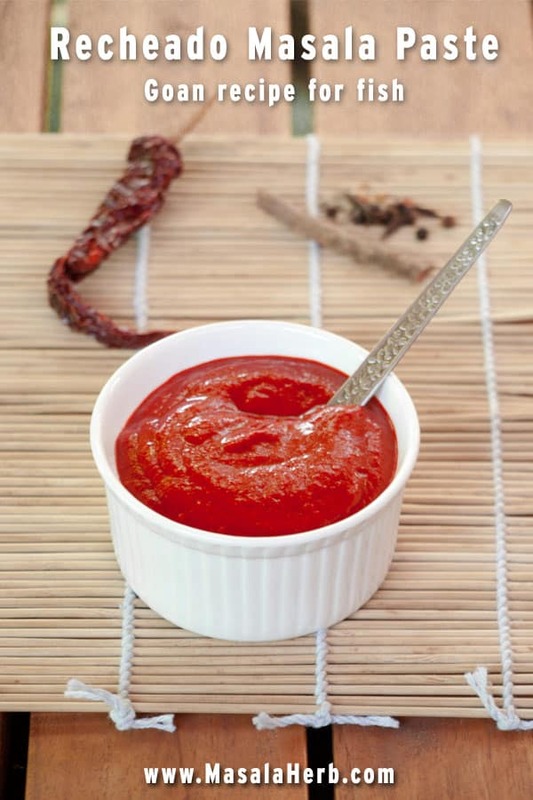 One of the most important spicy paste condiments from the sunny Indian coastline state Goa is the recheado masala. The famous paste is spicy hot, sour and very flavorful. How do you use Recheado masala paste? The Masala is used to flavor fresh seafood such as mackerels and prawns (hence recheado prawns and recheado mackerels) before stir frying the catch of the day in a pan with oil and infusing the spicy red paste flavors into the protein-rich sea fare. You can cut open raw bhende (Okra/Lady Finger) and other veggies and stuff them with the thick red paste too. Goan households often have their own recipes, which might vary a bit in spice amounts and choices of spices. Therefore, recheado masala recipes tend to turn out completely different in flavor and consistency. Personally, I don’t like all the variations I had come across, however, my mother in laws recipe is spotless and definitely a keeper. 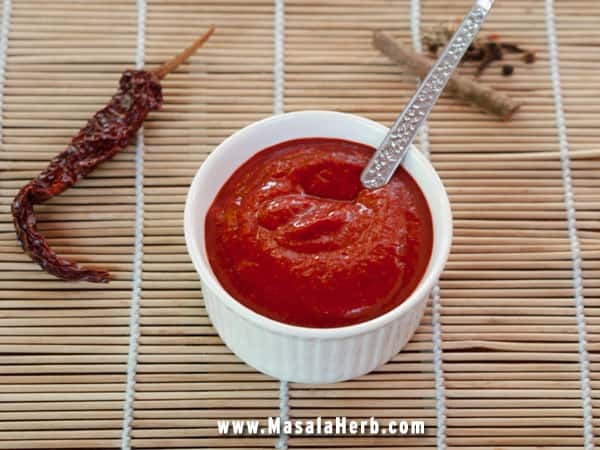 How to make goan recheado masala paste? The recipe is easy to follow and you can make it at home. You just need a good blender and all the fresh ingredients, which can be easily found anywhere in India. Some of the ingredients are Kashmiri Chili (Red dried chili as seen in the back of the picture), Indian Cumin (not Caraway seeds please! ), Peppercorns, Mustard seeds and so on. Oh and there are two peculiar ingredient additions to the paste which are very important or the recheado paste wouldn’t come out as it should. One is coconut vinegar (white wine vinegar will do too) and Coconut Feni. Feni is a high percentage transparent spirit made in Goa with either coconut or cashew. I compare it often to vodka or schnapps, just that feni has a very unique and different – and maybe unexpected – aroma. Vinegar and feni are essentials in the recheado masala recipe because they increase the shelf life of the paste and give it the extra flavor kick. If you don’t get feni in your area, then you can use vodka too. 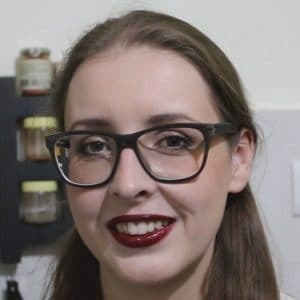 How to store recheado and how long can the red goan paste be stored? Store recheado masala in a dry and cool place. Keep the jar with the paste in a dark place, you can place it in a paper bag to keep it away from the light. You can store the paste for months if you want. Prepare a 500-milliliter jar full, store it and use it always just before frying the fish or prawns, as seen in my recheado prawns recipe. It’s that simple! Super hot red recheado masala recipe, made from scratch. Goan food lovers, this recipe is a keeper. Blend all the ingredients, store and marinate your fish or prawns before frying them in oil. Peel your garlic and ginger. Cut your ginger into chunks. Discard the chili stem. Keep all the spices soaked overnight in the vinegar with the feni in a plastic or glass bowl. Not in a metal bowl since the ingredients might react with the metals. Blend all the ingredients ginger, garlic, chilis, cumin, peppercorn cinnamon clove fenugreek seeds, mustard seeds, turmeric powder, salt, sugar, vinegar and coconut feni to a fine paste. If the paste is to thick add some more vinegar, it depends which consistency you want at the end. The paste should not be completely liquid. Do not add any water because that will reduce the shelf life of the paste. Store the smooth paste in a jar and keep in the fridge for further use. Fry with fresh fish or prawns. I’ve never heard of Coconut Feni — definitely will have to look that up! And get some — so I can make this. This looks so terrific! Thanks. No I haven’t marinated my fish in a spicy paste before, at least not that I recall. The ingredients in this list though sound marvelous. I can only imagine the flavor that permeates through the fish. I’m not familiar with coconut femi – I’ll have to check that out. Loved all the flavours into the masala..Definitely a must try for me!! I’ve never heard of this type of paste before but am a fan of Kashmiri chili, so I know I’d love it. Coconut feni? That’s a new one as well, but not surprised that John of Kitchen riff had used it before. 🙂 If I can find all of these ingredients, I’m going to give this paste a try. Thanks so much Helene! wow this is drool worthy. Can you tell me how spicy this turns out to be? the colour looks piquant. If you can’t get Fenni, use the same amount described in the recheado recipe with vodka.That means instead of 60 milliliter Coconut Fenni, use 60 ml Vodka. Your recheado will turn out fine like that. What can I find in a Chinese store the equivalent of our Goan Vinegar? I just know chinese stores selling rice vinegar and palm vinegar but I am not sure if you should use any of these for making recheado masala. I would use regular white vinegar instead. That should do the trick too and you get white vinegar all over the world. Thank you for sharing. I have a couple of recipes , but will try yours this time. Can I use goa coconut vinegar instead? I do get your news letter. Do you have the dry spices for geera meera? Thank you for your feedback. I would like to try that some time too, the masala with aubergine and shrimp sounds great! I’m from Mumbai, living in the US, made this for my hubby today. I didn’t have whole red chilli so I used 5 tbsp kashmiri chilli powder and enough white wine vinegar to make a thick paste, and stuffed the fish and slathered it on the outside and fried it…. He loved it! Thank you, this is a keeper. 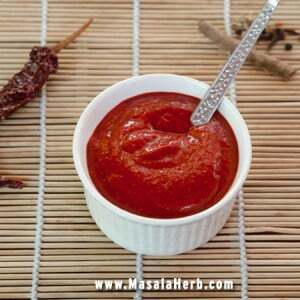 Hi, this may be interesting you: Goan Recheado Masala Paste Recipe!